I love when Beatrice pops by for a visit. I provide “the beverage” and she undoubtedly arrives with wedges of cheese stuffed in her pockets and a baguette under her arm. One of my favourite foodie PR gals, Bea is my contact for the Dairy Farmers of Canada. She’s a true lover of casein and whey and appreciates the magic they make. She recently popped by for cheese nibbles and wine sips with an oozing wedge of La Sauvagine ready to be devoured. 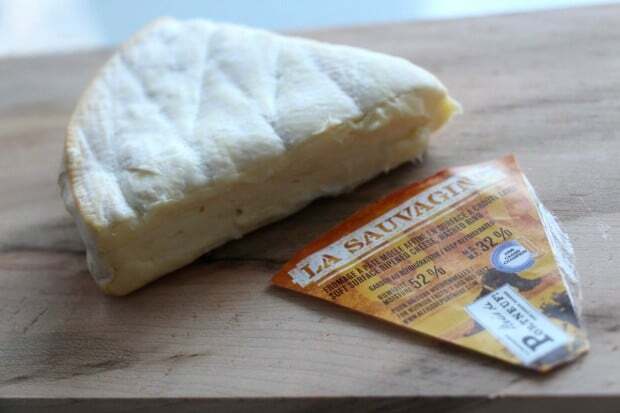 La Maison Alexis de Portneuf, based in Saint Raymond de Portneuf, in Quebec produces the multi-award winning fromage, La Sauvagine. They are argueably Canada’s most celebrated cheese producer, putting Canada on the international fromage map with their Le Cendrillon which was crowned Best Cheese in the World in 2009 at the World Cheese Awards. Inspired by “la sauvagine” (French for wildfowl) the more than 13 million ducks, geese and teals that are hosted in the Quebec sky each Fall, illustrations of some of which are featured on the packaging, artisan cheese makers created a remarkable product with a deliciously rustic flavour. Very delicate, it is made in small batches. A cheese with smooth creamy texture, it has a moist and supple edible rind that ripens from the outside in, a runny ivory body that is aromatic, salty, savoury, and spicy, and fresh butter melt-in-the mouth taste with a hint of mushrooms. A washed rind, triple cream, pasteurized cow’s milk cheese. It was the winner of the washed rind category and overall “Grand Champion” at the 2006 Canadian Cheese Grand Prix. Subsequent awards include the Gold Medal in its category at the World Cheese Awards in both 2008 and 2009.